Probably the hardest facet of teaching is differentiating instruction. Now that I’ve been teaching for five years and I have a handle on the content, classroom management, and other random everyday challenges I want to get better at reaching all my students in ways that best suit each individual student. It’s a tall order and it’s not something that can be achieved all the time, but I read a book that gave me new ideas I can implement next year. 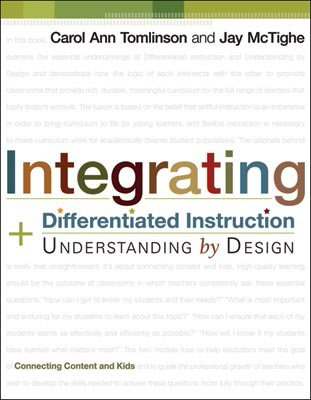 The book is called Integrating Differentiated Instruction and Understanding by Design. The latter idea–also known as backwards planning–is the lesson planning method to ensure that teachers first outline what students should know and be able to to do in the unit before they start planning the daily activities. From here, it’s easier to identify where in the daily activities a teacher can differentiate the material to support students of varying levels. This is a major issue in all content areas but I’ve found especially in language, where I teach freshmen through seniors, some with prior language experience and some without, and still others who are highly motivated to learn a new language and some who aren’t at all. I will face these same challenges every year and I need to try better strategies for teaching such a diverse audience. The first major goal for next year is to give students an outline of where we’ll be going each unit by giving them whole unit packets. On the first page I have put the unit goals and a list of all the items in the packet. I want to show students the link between the big ideas and what we’re doing in class to learn them. I also want to reinforce that the learning material relates to the end task or product. I think this will help more students stay organized and on top of their work if they are absent. I also think it will help me stay organized in my teaching by reminding me to reiterate the big ideas and remind students of those connections every day. My new packet cover page with unit goals and assignment tracker. The second goal for next year is offering more choices for learning. This is something I’ve tried in the past but I continue to tweak after trials in the classroom. I want students to have options of assignments and I also want to integrate more advanced vocabulary and practice grammar examples into the pre-made packets. In the past I have lumped all of this together, but now I want to explicitly mark what is advanced so that I can tell students what is above and beyond my expectations. In this way, I hope some will have more learning to do while I can help others who are struggling. Here’s an example of offering different practice assignments to students. Next year I have differentiated the tasks for point values based on the unit standards. Finally, one other major goal for next year is to align my grading practices with differentiated instruction. I just started doing standards-based grading last year but I want to expand it further. The idea of this grading system is that an “A” represents going above and beyond the prescribed unit goals–which should be more advanced material to push those students who need a challenge. A “B”, meanwhile, shows that a student mastered all of the essential knowledge and skills of the unit. A “C” means a student almost mastered the unit’s goals whereas a “D” or “F” shows that a student did not effectively master the material. I think by using these standards as grading metrics aligned with the unit goals I will be able to differentiate summative assessments for students too. From using this system in class this year I can also say that it’s better for students because they have the expectations and understand how they will be assessed. So I already changed my syllabus and I will add the standards-based grading scale to all work I plan on collecting. This is the grading scale I made for my syllabus. I will reinforce this system on all work students complete. This is an example of a rubric from last year. I want to modify it further but I really liked using standards-based grading. I think finally connecting the unit goals with the content and the grading will make it much easier to differentiate my classroom than in the past. I hope to make class time more flexible some days and allow students opportunities to work at their level to attain the grade they want. There’s a lot of work to do to get it these ideas in order, but I’m excited to try them out next year!